Welcome, all, again. A new viewing season has begun, one that looks to be rather strong in its offerings! Personally, I am especially pleased with the number and variety of this season’s slice-of-life series. 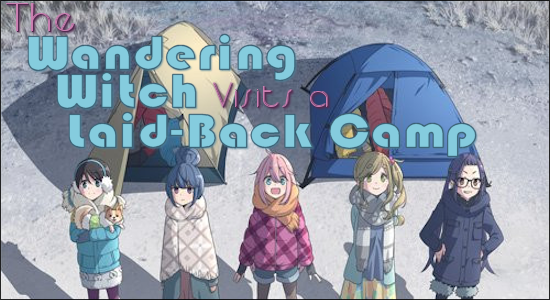 Our subject of discussion today is one of these, titled Laid-Back Camp (or Yurucamp). Now, this show has struck an immediate chord with me, and was an almost inevitable first choice for review. Why? You surely mean: why, other than the fact that it is relaxing, endearing, and celebrates youthful exuberance and friendship? Certainly all those things play to its favor. But this show also has the added punch of nostalgia for me. 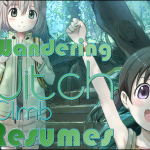 As long-time readers of this column might remember, my very first review herein was of Encouragement of Climb‘s second season (with much loving attention and explanation given also to its first season). That was three-and-a-half years ago, back in July of 2014. 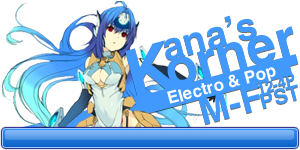 And now we finally have a spiritual successor to that beautiful, vaguely addictive show. The writing might not be as polished, but then again this show didn’t experience a preceding season as a roughly 3-minute short, which circumstance directly shaped the tight dialogue and story continuity found in Encouragement of Climb. 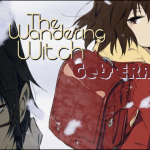 Still, viewers will recognize many similarities between the two shows, from characters’ personalities to equipment and even story settings. Fans of the former show (such as myself) will welcome their return to comfortably familiar environs. But what are those environs, exactly? Is this another show about mountaineering? No, it’s not. But it’s not that different, either. This show focuses upon camping, and sees its cast literally pitch their tents in different camping areas and circumstances, as did the girls in Encouragement of Climb upon numerous occasions. We watch again as the uninitiated become enthusiasts, learning to plan routes, pitch tents, cook outdoors, and navigate such often overlooked social conundrums as campground restroom etiquette. Pretty dicey stuff, some of this! But it’s great fun to watch, and provides viewers with an instant intimacy with the characters. You feel the cold when they shiver in the wind. You feel the welcome warmth of their campfire (which only reminds you of the cold on the side not facing the flames). And you even feel the profound pleasure of a simple meal prepared and eaten. Encouragement of Climb showed us how much fun the trip could be; Laid-Back Camp teaches us to stop and appreciate the destination as well. And again, we have a cast of characters perfectly suited to their story. Let’s begin with Rin, a quiet girl who enjoys solo camping. 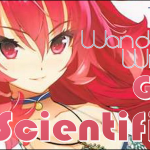 Her petite build and reserved nature make others fearful for her when they first encounter her out camping, but she is actually very knowledgeable and practiced, not to mention resourceful. Her friend Ena watches from afar, admiring Rin’s independence while nonetheless acting as a digitally connected guardian angel who stays in frequent contact via cell phone during Rin’s excursions. (Rin either hasn’t caught on yet or else simply appreciates the fact that Ena isn’t pushy about it.) Enter Nadeshiko Kagamihara, a girl whom Rin first notices as she makes her way by bicycle to a campsite in Motosuko. It is, after all, hard not to notice someone curled up asleep in front of a public restroom [PSA: this constitutes poor restroom etiquette! Do not attempt IRL.]. 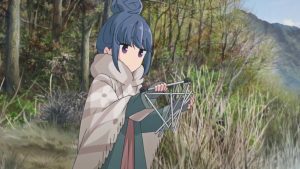 Cold, lost, and desperately hungry, Nadeshiko later somehow finds and invades Rin’s warm campsite, eventually doing the same to her cool heart. They even end up attending the same school, where Nadeshiko also meets Aoi and Chiaki, the only two members of the Outdoor Activities Club. 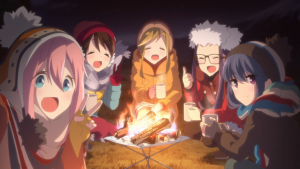 Spurred on by the transcendent beauty of Mount Fuji at night, witnessed with Rin at Motosuko, Nadeshiko immediately joins the Outdoor Activities Club in the hope of more camping. Sadly, though, the club is underfunded and under-equipped, meaning that camping is unlikely. Unless, that is, they can find and possibly recruit someone whose experience equals their enthusiasm. But wherever might they find such a person? And so we viewers are treated to a show with a welcome[ing] sense of familiarity while still getting to meet new characters and encounter new experiences. 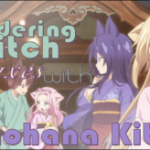 We watch in gleeful anticipation the accidental meetings and awkward introductions which will blossom into friendship, and wait to see how our heroines will traverse the landscapes of both countryside and the heart. And if that sounds a bit melodramatic, then let me assure you, dear readers, that entering into communion with nature–however briefly and under whatever circumstances–is a profoundly spiritual experience. As did Encouragement of Climb, this show captures that realization without browbeating its audience. 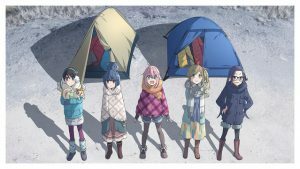 Laid-Back Camp is exactly what I want from a slice-of-life series: it is relaxing, enjoyable, and immediately recognizable through a softly filtered realism. It is life-affirming! And I appreciate that.